Playing the blues and still having fun. Hein 'Little Boogie Boy' Meijer, all the way from Amsterdam - Holland, has got the blues but is especially having fun. He loves the blues. You can hear it. You can see it. You can feel it. Straight from the heart, and full of joy. Blessed wiht a dark voice and a natural cheerful appearance Little Boogie Boy reaches young and old with his music. The Little Boogie Boy has been moving his way up in the European bluesscene, not surprisingly according to the qualities and enthousiasm of this frontman, singer and guitarplayer. Hein's been playing guitar since he was a kid and got interested in the blues real soon. Since 1990 he has joined several bluesbands in Holland but formed his own 'Little Boogie Boy Bluesband' soon. His passion for the blues explaines his many trips to Chicago and Mississippi. When he was only 19 years old he played there with bluescelebrities like Magic Slim, J.W. Williams and John Primer. It was John who gave him his nickname Little Boogie Boy, because when Hein was in Chicago he was actually to young to enter the bluesclubs but found a way to get inside. The Little Boogie Boy Bluesband is a three piece band and rounding out this trio are Monique de Jong and Hein's brother Harry Meijer, who both share the same interest for this music. Harry has been taking care of the drums in Hein's band almost his whole live and you can say he is a bluesdrummers bluesdrummer. Ever since Monique picked up her bass she has played with bluesartists both in Europe and the US like Magic Slim, John Primer, Nick Holt, Michael Coleman, 'Jelly Roll King' Sam Carr and T-Model Ford and many more. She really surprises them, and others, with her no-nonsense way of playing! These musicians are all inspired by Chicago- and Mississippibluesmen like Eddie Taylor, Jimmy Reed, Magic Slim and Frank Frost but also Johnny Taylor and Bobby Bland. But they don't really copy their songs, they play 'm the way they feel it. Honesty and dedication. That's what it's about for this bluesband. So far they've had quite a lot of successful experiences. Not only is the Little Boogie Boy Bluesband performing frequently in it's three piece formation on several famous Belgian, German and Dutch bluesclubs and festivals. They also have been backing up American bluesartists like Chicago bluessinger Tommy McCracken, Chicago bluesman John Primer and Nick Holt during their European tours. And sometime the Little Boogie Boy Bluesband go to the US to do a tour themselves. In 2002 they released their second album 'In Case You've Got The Blues', which was live recorded in the well-known bluesclub 'Red Kees' near Amsterdam. During this show the band brougt up their additional fourth player, Bart Landstra, who accompanies them occasionally on his harmonica playing his unique, authentic style. Also on this album you will hear Hein play the slide guitar in a traditional way. 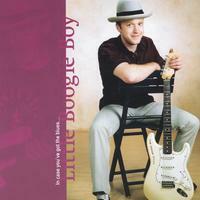 During the last tour the Little Boogie Boy Bluesband did with Nick Holt, they made recordings for a new album. This will contain original songs of both Nick Holt and the Little Boogie Boy, it will surprise you! The album has been released already and is also for sale on cdbaby.com.